So folks, let me introduce to you my own micro framework – Class.js!! 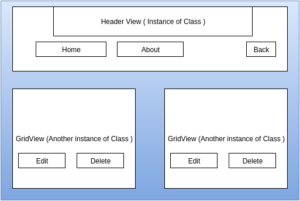 It is a framework that can be used to manage your view (DOM element). This lightweight micro framework provides minimal design to manage the view layer of your application and will be useful where you have to create both static and dynamic content in your DOM. Each nested view within your DOM is an instance of Class. You can write your HTML template on separate file and can use it whenever the view is initialized. Tagna me : It defines the kind of element you want to create. Referring to the above code, we have created a div element. You can create li, p, a etc. Element: A predefined class property where you will append your dynamic html content. A mutation observer is being designated on the Element property. Whenever an html string gets inserted to this property, it will search for those html selector (id, class, tagname etc) defined above within the html content and attach an event to that element. className : The class name assigned to the Class element. Attributes : The list of attributes that you want to assigned to create the element. Here, the key will be an attribute name and value will be the attribute value. Init: A constructor method that will invoke when an instance of Class will be created. You can write some logic that will execute whenever init method gets called. Others : onClickEdit, onClickDelete are event handlers for those respective events. Inside our init method we have loaded the view template, and saved the template to tpl attribute. I have described the basic overview of my own micro framework which solve the purpose of managing the view. The code will be available on github, you can download and go through the code for an detailed explanation. Let’s move towards building our framework Class.js. As you can observe a Class framework is fundamentally a method Class which accepts object as a arguments with a set of property and method. Let’s begin on how we have designed our Class framework. The below method is the central part of Class library. I have added a sample project using our Class framework, there are additional library which might be required if you are building a single page application. History.js: If you wanted to build a single page application and you want a well defined url, histroy.js is there to rescue. The api is similar to History api with support for older browser. MutationObserver: For working with older browser especially Safari and IE MutationObserver api is not available on those browser. I have came across a library that provides the feasibility to work with MutationObserver, if it is not found as a part of native library. EventEmitter.js: This is a helper library which will provide you the liberty to register a custom listener to listen for an event. You can emit an event from anywhere within your code and the listener will get invoked once an event occurred. Go through the demo application to get more info on EventEmitter library. We have already come to the end of this blog, you can refer this tutorial for learning purpose. You always have the liberty to select any framework of your choice, but knowing how to write manageable code using better design pattern is the purpose of this article.